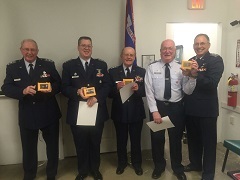 3/6/2016–Ashville, NC–Civil Air Patrol instructors at a recent CLC training held in Asheville, North Carolina, received a surprise gift at the Asheville Composite Squadron’s monthly awards night for their instructive efforts. A student at the school, from Wisconsin Wing, was so impress with the instructors that he sent a gift of cheese. Cheese is something Wisconsin is famous for. It was sent to the Asheville Squadron Commander, LtCol Harry Fiedler, who was also a student at the CLC training, to give to the staff of the CLC to show his appreciation for their volunteer work as instructors. The instructors were all smiles about the cheese even after hearing it unique aging process. There are no details on how many of the instructors actually consumed the cheese or just are hanging on to it as a nice gesture from a student from another wing.